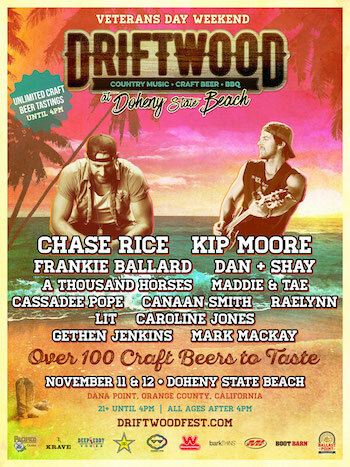 Driftwood at Doheny State Beach returns to Orange County this Veterans Day Weekend, bringing top country music acts, California-focused craft beer, and top notch BBQ to Dana Point on Saturday, November 11 and Sunday, November 12. With a heavy emphasis on supporting local breweries, the festival will feature over 100 craft beers, some of the best BBQ in the region, and a full day of music with headliners Chase Rice and Kip Moore, plus newly added performers Mark Mackay and Gethen Jenkins, along with Frankie Ballard, Dan + Shay, Maddie and Tae, RaeLynn (whose WildHorse album debuted at #1 on Billboard's Country Albums chart earlier this year), and more. In addition to a diverse selection of participating breweries, the festival will host its very own ale, Driftwood Blonde, created for specifically for the event. Driftwood collaborated with the brewmasters at south Orange County brewery Artifex Brewing for the beer, which is a 5.5% Honey Blonde Ale. Driftwood Blonde goes down smooth and crisp with hints of honey, is the color of gold and it tastes like sunshine! Driftwood Blonde will be available exclusively at Driftwood at Doheny State Beach. In honor of Veterans Day weekend, the festival is offering a discounted $89 2-day ticket and $45 single-day ticket for active and retired military, as well as their family members. The military ticket includes Early Entry Admission and a complimentary roundtrip shuttle between Doheny State Beach and the Outlets at San Clemente. Driftwood at Doheny State Beach has also released a single-day 4-pack offer for both days, (4 tickets to Saturday or Sunday) for only $199. General Admission and VIP tickets are available for purchase at www.DriftwoodFest.com. All tickets include craft beer tasting and access to view the music stage. The list of participating breweries includes: AleSmith, Artifex, Backstreet Brewery, Ballast Point, Beachwood Brewing, Bootlegger's Brewery, Bottle Logic Brewing, Chapman Crafted Beer, Coronado Brewing Co., Docent Brewing, Hangar 24, Karl Strauss, Lagunitas, Left Coast, Lost Coast Brewery, Lost Winds Brewing Company, Modern Times, Noble Ale Works, Oskar Blues Brewery, Ritual Brewing Co., Sierra Nevada, and Telegraph Brewing Company, and more to be announced. 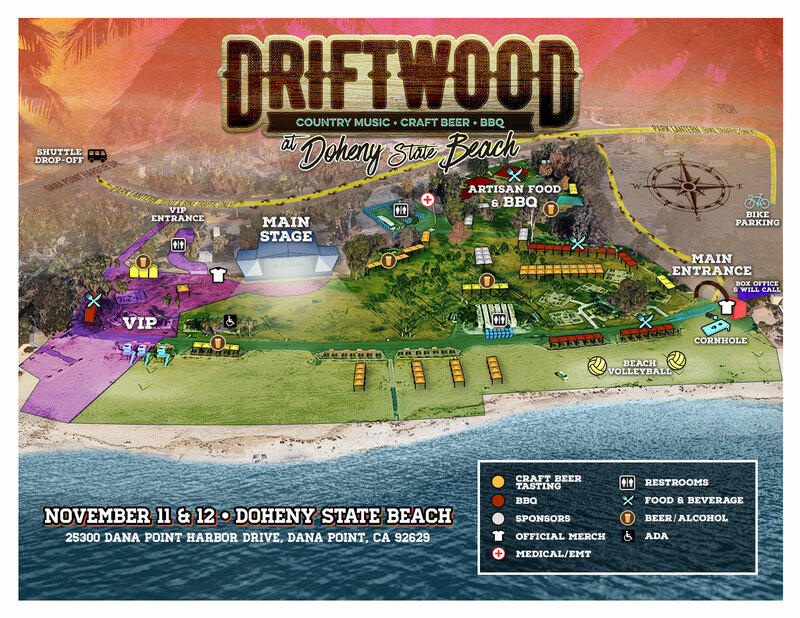 Driftwood at Doheny State Beach is produced by Synergy Global Entertainment (SGE) and Brew Ha Ha Productions. The festival producers encourage attendees to drink responsibly. 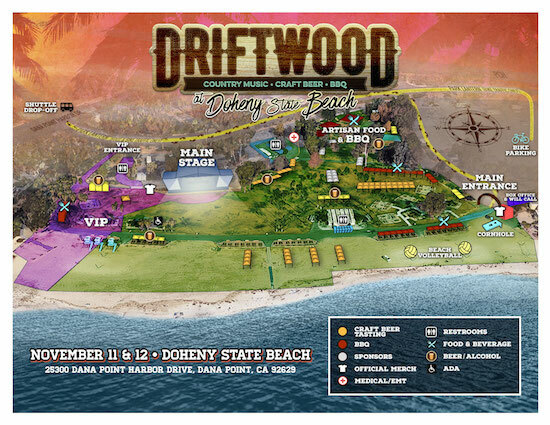 Sponsors for Driftwood at Doheny State Beach include Pacifico, Ballast Point, Deep Eddy, Rockstar Energy Drink, Musicians Institute, Cosmic Fog, Weinerschnitzel, Krave, Bark Thins, Boot Barn, George Dickel Whisky, and more. Brew Ha Ha Productions (BHHP) is California's most successful craft beer event producer and creates award winning, often sold out, events. Fueled by a desire to promote craft beer, along with a vision of creating legacy beer fests and events, BHHP was conceived 10 years ago. BHHP produces multiple celebrated festivals with rave reviews annually and is best known for their signature events like the flagship Brew Ha Ha Craft Beer Festival (9/23/17), Brew Ho Ho Holiday Ale Festival (12/9/17), Sabroso Craft Beer, Taco and Music Festival (4/7/18), and the award winning Brew Hee Haw at the OC Fair Craft Beer Roundup (July 2018). Their 'pairing' of Craft Beer Tastings along with top name music including Punk In Drublic (6 events in 4 states including Huntington Beach 10/28/17), Driftwood at Doheny State Beach (Doheny 11/11-12/17), and more are experiencing unprecedented popularity and growth.